I have to admit, the unprofessional, biased and integrity-free American news media has me suspecting everything these days. 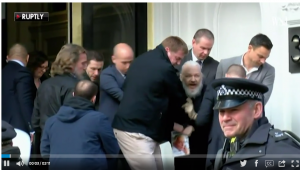 Since they have a pattern of taking news off the front pages that they don’t like by introducing other hyped subjects, it occurs to me that today’s arrest of Julian Assange, WikiLeaks Founder, after hiding in plain site in the Ecuadorian embassy for a decade, was a little suspicious. Attorney General Barr’s testimony this week had thrown the Democrat and media anti-Trump narrative for a loop. So, it is at least coincidental that this week would be the week that authorities would all of a sudden be able to get him out of the Ecuadorian Embassy in the UK. At worst, it was contrived to free the Barr story from the front pages. After the announcement of his arrest, the anti-Trump media depression over the Barr testimony was replaced with renewed excitement of another subject on which they could cast negative attention to Donald Trump. Interestingly, Julian Assange is a figure that both sides loves and hates. The right hates him for his release of stolen government & military information in 2010. The left hates him for his release of stolen information on Hillary Clinton and her campaign in 2016. Alas, an astonishing number of people on the right and left have apologized for Mr. Assange depending on whose political ox he was goring at the moment.